Justifacts would like to take a moment to mourn the loss of our dear friend and mentor, David Hunter. David, the founder of Hunter Associates, passed away April 14, 2013, after a brief battle with cancer. David was known for making the most out of all the opportunities in his life. Also, he was known for having the courage to do things his own way. While at Amherst College, he was fortunate enough to study under the great American poet Robert Frost. David took special pleasure in Frost’s poem, “The Road Not Taken”. That poem concludes with the lines, “Two roads diverged in a wood, and I took the one less traveled by. And that has made all the difference.” Those words went on to truly personify David’s life. David became a leader in both business and the community. Among his many achievements, some to point out: serving as the chairman of NASDAQ in 1988, chairman of the National Association of Securities Dealers Inc from 1986 to 1987, and serving on the board of the FINRA Economic Education Foundation from 2005 to 2012. He generously served as a respected leader in his community as the chair of the Pittsburgh Allegheny Chapter of the American Red Cross from 1988 to 1992 and the East Central AAA from 1987 to 1990. 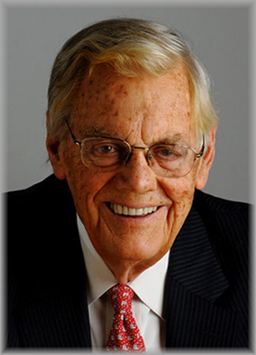 Additionally, he served as a trustee of the Allegheny Trails Council Boy Scouts of America for 30 years, Westminster College for 25 years, and University of Pittsburgh Katz Graduate School of Business for more than 30 years. As an early investor, David was instrumental in helping get Justifacts to where it is today. Over the years, David was always available to share his time and talent. He was an inspiration to us and he will be sorely missed.